The machine structure is developed to meet the European standard. Battering machine SJJ600-Ⅴ can offer a even coating of the chicken (poultry), beef, meat, seafood etc with a two-layer batter curtain on the top and a batter under-bath. It is suitable for the processing procedure before breading and predusting. We can provide you with 900, 1000mm other specifications of products selection. We can produce hydraulic driving equipment. Special design of batter pump can greatly reduce the cutting of the batter. Fast-combine design, easy to clean, less damage to the viscosity of the batter. SIEMENS electric apparatus guarantee the safety and reliability. Can be precisely combined to a forming machine, a breading machine or a fryer to realize the continuous producing. Stainless steel made, creative design, reasonable structure and reliable Ffeatures. 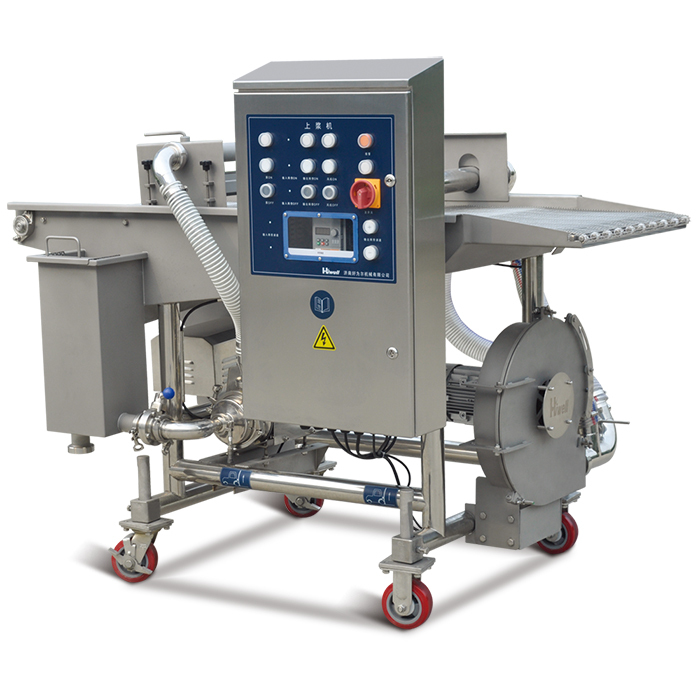 Battering machine SJJ600-Ⅴ can offer a even coating of the chicken (poultry), beef, meat, seafood etc with a two-layer batter curtain on the top and a batter under-bath. It is suitable for the processing procedure before breading and predusting.